By rebasing US GDP in gold rather than the CPI, the true extent of the economic cycle is revealed, from expansion to depression. Using gold to rebase nominal variables avoids the distortions and smoothing effect brought about by the CPI. The gold rebased GDP reveals the depths of our current economic malaise and past economic cycles show how we may recover from it. So why rebase US GDP in gold, rather than by a CPI index? Well, as I have discussed here, I do not regard the CPI as a legitimate measure of inflation. It sometimes overstates and at other times understates the true rate of price inflation, depending upon changes in the standard of living. Gold is a measure of price inflation that has stood the test of time. An ounce of gold does not fluctuate in quality, whereas the consumption basket of the CPI does. So gold provides a more stable, accurate and transparent measure of price inflation than the CPI. What is perhaps surprising is just how widely gold has deviated from the CPI measure of price inflation over the last 40 years. The CPI has totally skewed measurement of real variables. By rebasing GDP in gold, we get back to the true measure of economic performance. The periods of economic expansion and decline tie in with periods of government intervention. The last period of economic decline, in the 1970’s, was brought to an end only by cuts in taxation & regulatory activities in the early 1980’s. 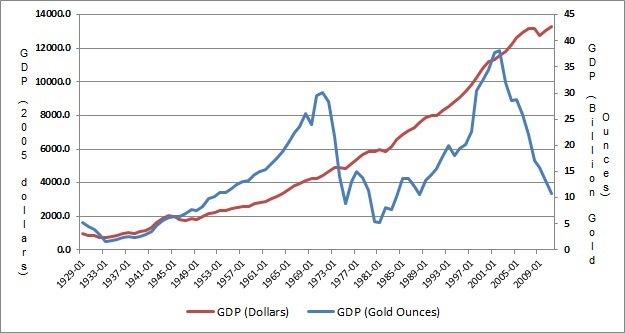 It is likely we will need a similar response in order to bring the current cycle of economic decline to an end.The GDP in gold series shows 3 periods of economic decline: the 1930’s, 1970’s and the last 10 years. This current decade is following a depressingly similar pattern to the 1970’s. Also of note are the great periods of economic expansion experienced in between the decades of decline. From real GDP in gold, we can back-out the required rate of money supply growth that would have kept the price of gold stable. 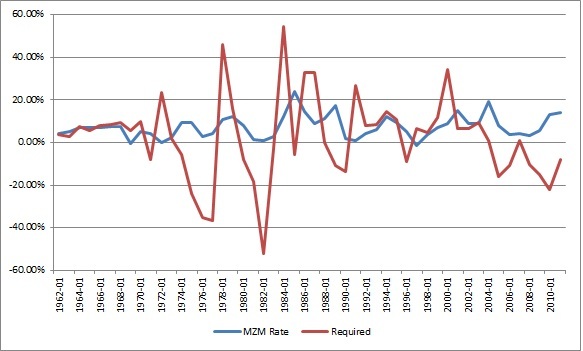 We can then compare this with the actual rate of monetary growth (MZM), to see how aggressive monetary policy has been. You’ll notice volatile monetary policy in the 1970’s and how this led to big, mostly upward swings in the price of gold, when the MZM rate was taken above the required rate. Then, in the early 1980’s, monetary growth was restricted beyond the required rate and hence we had a fall in the price of gold. Over the last 10 years the rate of monetary growth has been consistently above what was necessary to stabilise prices. Without the policy of quantitative easing, it is likely that MZM would have fallen towards the required rate and gold would have stabilised rather than increased in price. Distortions in the CPI have masked both periods of economic decline and of economic growth. The GDP in gold measure reflects the marked movements we have experienced in the economy. I believe these swings in GDP are caused by government intervention in the economy. Unfortunately, the last 10 years have been a time of economic decline, marked by increased government spending and regulatory activity. The GDP in gold measure reflects the true rate of decline. The solution to our malaise is to reign in government spending, taxation and regulatory activity. As and when this solution is adopted, it is likely to MARK THE END of the run we have seen in gold and commodities. It will also be the beginning of the end for this period of economic decline that has so far lasted 10 years.